During this Atlas period there were more Brent Geese in the county than for at least a century, as it seems that a wintering flock of this species is gradually establishing a presence on the Dee, spilling over from their traditional Irish wintering sites. There are three distinct components to the British population. Light-bellied Brent Geese Branta bernicla hrota breed on islands in the Canadian Arctic and northern Greenland, and migrate through Iceland to winter mostly in Ireland. Another population of the Light-bellied form breeds in Svalbard and winters mainly at Lindisfarne (Northumbria). Birds of the nominate Dark-bellied race Branta bernicla bernicla breed on the tundra in Arctic Russia and winter in the Netherlands and south-east England. Apart from the obvious colour phases, birds from the different populations are not individually identifiable in the field, but their fidelity to wintering areas makes assignment to origin straightforward. The Canadian population is now at its highest, over 30,000 individuals, having doubled in a decade between the mid-1990s and mid-2000s. As the ice starts to close in on their breeding grounds, they undertake one of the longest wildfowl migrations, staging in Iceland on the way, and arriving in Strangford Lough (Northern Ireland) during October/ November where they feed on eelgrass zostera. As they deplete this marine grass, the geese change diet to a wide range of estuarine foods including algae and salt-marsh grasses, and might move a little way inland to find grasslands or cereal crops. They also disperse during the winter, mostly to sites in southern Ireland, but some birds cross the Irish Sea to spend time at estuarine sites in England and Wales, including Anglesey, Morecambe Bay and the Dee. There are relatively few birds at each site, but they have been increasing year by year, especially during the 21st century, perhaps driven by the rise in population and pressure on feeding grounds at their traditional Irish sites. The flock on the Dee usually peaks in mid-winter, with a maximum total of 121 on the January 2005 WeBS count (Banks et al 2006). As in the Atlas map, they are mostly found near to Hilbre, occasionally along the north Wirral coast or extending up the Dee estuary, apparently feeding on algae and seaweeds found on the rocks. A few dark-bellied geese, in single figures, are noted every winter, often associating with the light-bellied flock, but confusing the inference about the birds’ origins. Light-bellied Brent Geese are subject to intense study including satellite-tracking from Ireland back to their breeding grounds. A colour-ringed female, ringed in Iceland in May 2005, was on Hilbre for 12 days in November 2005 before moving to spend the winter in Hampshire with a flock of dark-bellied birds, and was seen again in Iceland on spring migration in 2006. She was next reported in Northern Ireland in October 2006, and again on Hilbre for a longer stay, 29 November 2006 to 16 January 2007, pausing briefly on Anglesey on her way back to Iceland, where she was seen in spring 2007 with a possible mate. Proof of her breeding grounds came from Canadian researchers who saw her on Bathurst Island in July 2007, with another stopover in Northern Ireland in October 2007 before revisiting Hilbre from 15 November 2007 onwards. One could hardly have wished for more information from one bird: evidence of breeding and wintering areas, spring and autumn passage sites, mixing of the two races then recurrence in winter quarters. 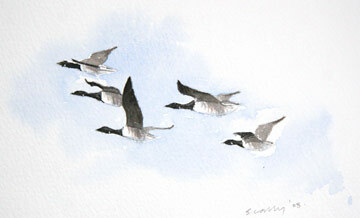 Brent Geese have never been common in the county. In the 19th century, Coward and Oldham (1900) wrote that Brent Geese visit the Dee Estuary in winter ‘in considerable numbers’, although the only record of more than an odd bird that they quoted was about two hundred seen on February 7th 1888. By 1910 Coward revised the description to read that ‘The Brent Goose visits the Dee Estuary almost every winter in small numbers. As a rule the flocks are not large ...’. For instance, in winter 1904/ 05 the largest party was 18 birds. The Brent has only ever been a rare visitor to the Mersey: in February 1895 one was killed on Ince Marsh. Bell (1962) noted 40 on the Dee on 26 February 1916, then six at Gayton 16 November 1916, but no further records until 1928, after which occurrences were logged almost every year but almost invariably in numbers less than ten and all from the Dee estuary. Numbers of all three Brent Goose populations crashed in the 1920s and 1930s, in part because of a loss of eelgrass through a parasitic infection: perhaps the few seen in Cheshire were wandering birds, trying to find suitable food. The duration of their visits in practically all cases was said to be very short, with most of the records in the period November to February but occasionally in October. Until recently, most reports do not give the colour form. Fortunately, fewer Brent Geese are kept in captivity than most other species of wildfowl, with consequently fewer confusing records of feral birds. Bell (1967) noted that three, probably dark-breasted, on a flash at Sandbach on 18 March 1964 were probably the first inland record since one was shot at Combermere on 5 November 1895. Unusually, a flock of 39 dark-breasted was seen off Hilbre on 17 January 1960. The county bird reports of the last forty years show that the species remained a scarce annual visitor, often just odd birds and nearly all in the Dee estuary, until the mid-1990s. There were more records, but usually still in single figure flocks, during the rest of that decade, until the winter of 2000/ 01 saw an influx of long-staying birds, with up to 43 birds on the January Dee WeBS count. Similar numbers were found each winter until 2004/ 05 when there was a big jump to over 100 birds, a level that has been maintained each winter since. As well as changes in status, the races of Brent Geese have undergone several changes of English name. In Coward’s books, the colour forms are not mentioned; Bell referred to them as dark-breasted and light-breasted; the national bird recording organisations, BOU, BTO and WWT have used the terms dark-bellied and light-bellied for the last fifty years, but in some bird books, and Cheshire Bird Reports, the latter are called ‘pale-bellied’! Whatever they are called, their recent increase is interesting and their status in Cheshire and Wirral should be carefully monitored.